These past eight months have been one of the most enlightening experiences of my university career. I was given an opportunity to be a Research Assistant for Dr. Sonya Grypma, Dean and Professor of Nursing at Trinity Western University in Langley, BC. Her current research project examines nursing during wartime in China and includes United Church of Canada missionary nurses (1937 to 1950). I was introduced to her by Dr. Marshall, who knew I wanted to do research in the history of China with my Mandarin language skills as well as an interest in research assistance work. This experience has taught me a lot about what it means to be a historian and the skills necessary to be one. This includes planning a trip to the United Church of Canada Archives, self-discipline, and digitizing material. Being new to this role, I was quite nervous taking on the tasks set out for me, but it helped when I had a plan. Planning a trip to the archives consisted of asking questions, both from my supervisor and the archivist, as well as knowing what documents I needed to research. Before I could even think about visiting the archives, I had to actually visit the archives’ website to learn what I could and could not do – it also informed me of any additional costs. I also made sure to ask a lot of questions and help whenever possible. For example, there was one finding aid unavailable on the website, but I managed to access it after asking the archivist. Upon arriving at the archives, the archivists had everything set up for me. All I had to do was go through the material, verify them, and digitize them as instructed. This process taught me the importance of preparing for my visit to the archives. 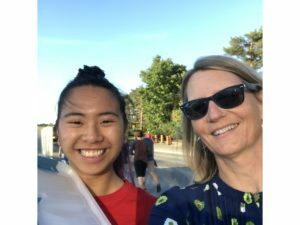 It was a breeze getting everything together and I was done quickly, which allowed me to go through the documents twice to ensure I had everything asked by Dr. Grypma. At the archives, I discovered many interesting documents, ranging from maps, photos of nurses, university brochures, and letter correspondence. Below is a photo of nurses from the Woman’s Missionary Society Hospital for Women and Children in Chengdu, Szechuan in 1932. 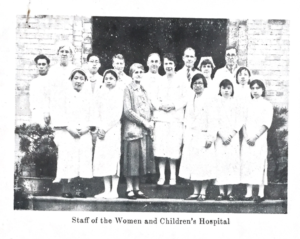 There was a report that went along this photo, noting that the number of applicants into the institution saw an increase in patients and application to be nurses. 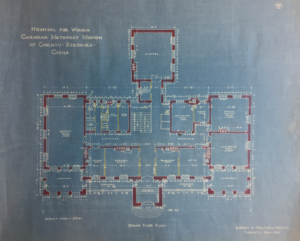 Another fascinating find were the blueprints for the Hospital for Women Canadian Methodist Mission. The blueprints show the four floors of the building. I believe it was constructed sometime in 1912 based on this photograph found on the University of Toronto’s website. The basement level was mainly for staff operation with the laundry room, kitchen and nurse’s dining room located there. The ground floor was mainly used a reception area and general offices, it also housed the chapel and some wards. The second floor housed more specialized and private wards, including surgical wards and obstetrical wards. 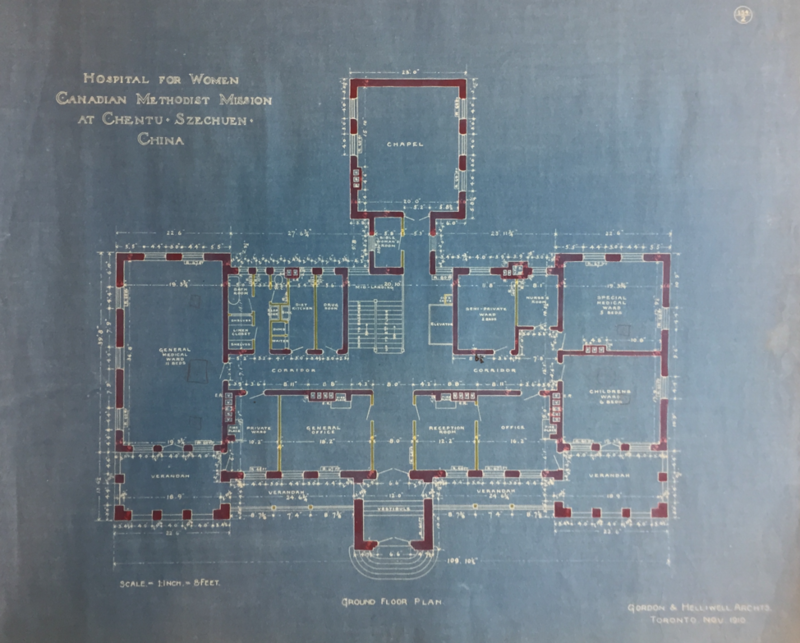 The third floor was where the isolation wards, opium ward and nurses’ bedrooms were located. I was surprised to find the nurses’ bedrooms located so high up in the building as well as so close to the opium and isolation wards. I assumed they would be located closer to the basement where the dining room was and away from work, so they had enough space to rest. This experience also taught me to discipline myself. This work did not contain any direct supervision as Dr. Grypma is based in BC while I am in Ottawa. I had to figure out how I was going to delegate time for this work. After completing the archival work, I received more opportunities to continue assisting Dr. Grypma, using missionary family records from a private collection. I had to manage my time appropriately, ensuring that I still caught up with the work whenever I was busy. When I had a busy few weeks, I would allocate at least 2 hours while for less busy weeks, I did 16 hours. I also had to ensure I was asking questions when I was unsure about things. It made sure I could understand what was expected of me. It really challenged me to keep up the work I set out to do. As for more technical skills, I learned to digitize primary source materials. Not only did I learned to scan photos through my iPhone (did you know you could do that with your iPhone? ), I learned to carefully handle each material when I was scanning the material. It is incredibly crucial to handle with care because you do not want to damage these fragile materials. After scanning each material, I had to record them in an orderly and systemic fashion using a spreadsheet. It acted as a great search index, ensuring Dr. Grypma could easily find the material. It also made record-tracking a lot easier. I could easily check whether I skipped or missed any documents I was supposed to scan or organize. Overall, I am very happy with the experience. I took away a lot of skills besides the ones discussed. I found that if I had time, I would like to have go into detail about the life of Norman Bethune. He was one of the characters I found interesting while sifting through the documents provided by Dr. Grypma. I found it fascinating that he was well-acquainted with Mao Zedong and wondered what other nurses or doctors thought of this situation. Nevertheless, I felt that this experience has been incredibly useful in solidifying my career goals. Once again, thank you so much to everyone who gave me this opportunity. I am truly grateful for the tasks I was given. Figure 3: Dr. Grypma (right) and I met twice. This was the first time we ever met. Here I am excited to receive more documents to digitize. Lui Xia Lee is a fourth-year student in Journalism and History at Carleton University, Ottawa, Canada. The author would graciously like to thank Professor Sonya Grypma, Professor at the Trinity Western University’s School of Nursing, Professor Dominique Marshall of the Department of History at Carleton University, Carleton’s Discovery Centre program for undergraduate research I-CUREUS, and the United Church Archives in Toronto. Thank you, Sonya, for guiding and trusting me with the tasks set out. Thank you, Dominique, for introducing me to Sonya and always presenting research opportunities to me. Thank you, I-CUREUS, for funding this opportunity. Thank you to the United Church Archives in Toronto for a smooth archival research experience. Images are reproduced here with the permission of the United Church of Canada Archives, 40 Oak Street, Toronto, Ontario.